In 1832, an American artist sailed home from Europe. He had spent some time painting in Europe and hoped to sell his pictures when he arrived home. 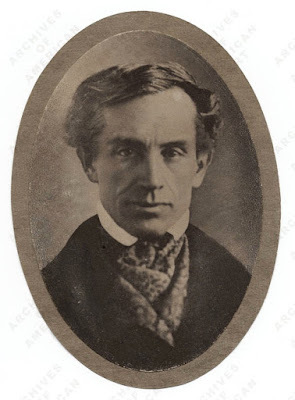 His name was Samuel Morse. The journey on the ship was to change Samuel Morse’s life. He met a young chemist from Boston, named Charles Jackson, who showed him how an electromagnet works. Morse became interested in electricity and in the idea of sending messages along electric wires. Samuel Morse was one of the first people to make an electric telegraph. An electric telegraph uses an electric current to send messages along a wire. Operators of this electric telegraph machine sent messages down the line in Morse Code. This telegraph was not what made Morse famous. He gave his name to the code of dots and dashes which he invented. Until this time, most long distance messages were sent by semaphore. The problem with the electric telegraph was that an electric current can be arranged in only two ways. Somehow a way had to be found of using the flow of current to make a code that could be sent along the wires. Morse’s answer was to make codes for different letters and numbers out of short and long bursts, or pulses, of electric current. He called these dots and dashes. Using dots and dashes in different orders made the different codes. 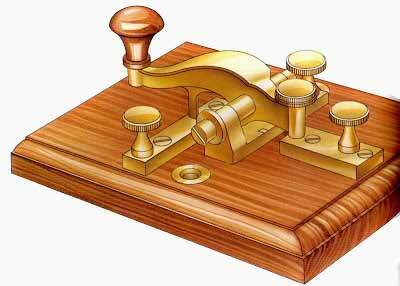 The Morse “key ” (Morse Code Key) which makes the pulses is a kind of switch that turns the current on and off. Messages sent by electric telegraph would be marked by the receiving machine on a moving strip of paper. Then the telegraph operator would decode the dots and dashes into ordinary letters and numbers. But operators who used Morse Code soon became skilled at “reading” the messages directly from the clicks made by the machine. Morse invented a different dot and dash pattern for each letter and number.The emergency signal in Morse Code, SOS, is known to sailors all over the world. They use it to call for urgent help if a ship is in danger.